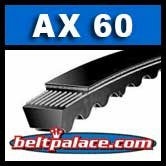 AX60 Power King Molded Notch V-Belt. 1/2" W X 62" Outside Length. Industrial Grade Cogged V-Belt AX-60. More grip and less slip than Classical A60, 4L620 FHP V-Belts.